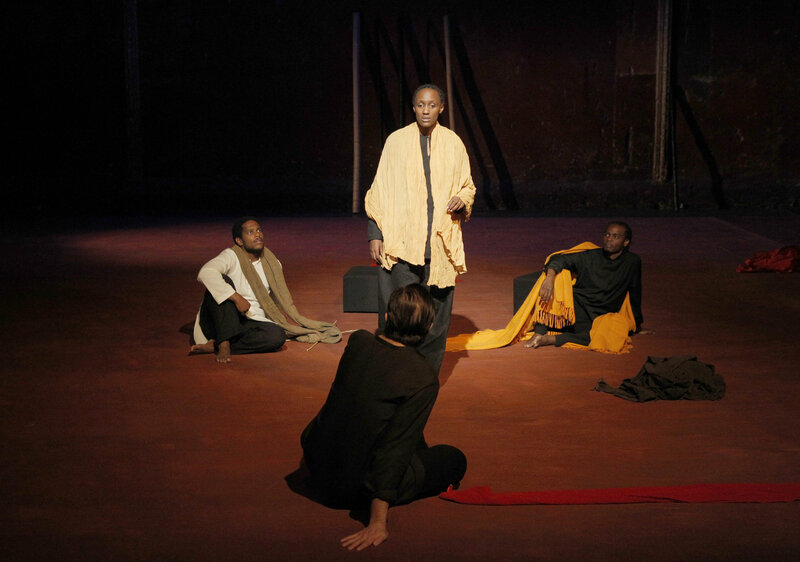 Jared McNeill, Carole Karemera, Ery Nzaramba (turned : Sean O’Callaghan) in Peter Brook’s production of “Battlefield.” Photo credit: Pascal Victor / ArtComArt. Nonagenarian Peter Brook is one of the most admired stage directors alive today. Over forty years ago, he left The Royal Shakespeare Company (which he co-founded), and the commercial theatre generally. Moving from England to France, Brook founded the International Centre for Theatre Research. His company spent some years visiting rural villages in the Middle East and Africa, exploring new ideas about training, performance, and story telling. Then, in 1985, after a decade of development, came his most famous production: a nine hour play by Jean-Claude Carrière (with whom Brook closely collaborated) based on the Indian epic, the Mahābhārata. The epic, considered to be the longest poem ever composed, dates from at least the fourth century. It is recognized among the universal masterpieces of world literature, such as the Bible, the Qu’ran, or the works of Shakespeare.About a year ago, Brooks revived a short segment of the Mahābhārata, titled “Battlefield.” It is this that can now be seen at A.C.T. Given Brook’s reputation for masterful staging, and knowing this piece is drawn from one of the world’s greatest epics, you might anticipate a lavish spectacle, full of color, movement, sound, and fascinating tableux. Instead, Brook presents a nearly bare stage with little to see but a few bamboo poles, a chair, and a drum. There are some brightly colored cloths lying about. The skeleton of the theatre and its lighting fixtures are exposed. It is, indeed, practically, an empty space. A musician takes a seat in the chair, and begins to drum. An actor, in the role of Yudhisthira, drapes himself in a cloth and starts talking. Victorious in war, he is disgusted at the carnage and refuses to assume the role of king. He goes to consult his grandfather, Bhishma, who instructs him in a series of parables. These are acted out by a handful of performers, utilizing nothing more than a few bits of drapery, their voices, and their bodies. What distinguishes this play is a stunning simplicity. This is theatre pared down to an empty room, a few actors, and stories to tell. Primacy goes to the stories, presented with childlike directness and purity. The actors call no attention to themselves. There are no elaborate costumes, lighting effects, or illustrative sets. In a recent interview, Brook was asked what he values most in his art. He replied, “Elimination.” Experiment with all possibilities, but then eliminate as much as possible. “Battlefield” demonstrates this to perfection. Everything but the story is eliminated. For me, it was like listening to a fairy tale when I was two or three, the most magical thing I can think of. In retrospect, one may be struck by the virtuosity of musician and actors: Master drummer Toshi Tsuchitori (who accompanied the original production of the Mahābhārata) and actors Karen Aldridge, Carole Karemera, Jared McNeill, Ery Nzaramba, and Sean O’Callaghan. The costumes and lighting design by, respectively, Oria Puppo and Philippe Vialatte, are as subtle as the scent of hidden flowers in a garden, and as necessary to the experience. Nobody in the Bay area who cares about theatre should miss out on this. ‘Battlefield’ can be seen for a limited run at A.C.T. through May 21. For further information click here. “Battlefield” based on The Mahābhārata and the play written by Jean-Claude Carrière. Adapted and directed by Peter Brookk and Marie-Hélène Estienne. Musician: Toshi Tsuchitori. Costume Design: Oria Puppo. Lighting Design: Philippe Vialette. Karen Aldridge (from May 16 until May 21), Carole Karemera (from April 26 until May 14), Jared McNeill, Ery Nzaramba, and Sean O’Callaghan. Posted in Reviews.Tagged A.C.T., Battlefield, Charles Kruger, Jean-Claude Carriere, Mahabharata, Marie-Helene Estienne, Peter Brook, San Francisco bay area theater reviews, theatrestorm, Toshi Tsuchitori.